Amana wine refrigerators offer wine lovers elegant wine storage cabinets that ensure perfect conditions for storing wines at home. Amana is the brand of Maytag UK which looks back to more than 150 years history in developing innovative home appliances that are known for reliabilty and durability. Amana has developed its exclusive wine cabinet range in recent years offering 3 elegant wine refrigerators with 3 temperature zones for freestanding use.These high-end home wine cellars are available in the United Kingdom from various retailers. The Amana Reflection Wine Cabinet can accommodate up to 173 – 203 bottles of wine. The cabinet has three temperature zones allowing you to mature some of your favourite wines while keeping others at serving temperature. The all-black glass door framed in stainless steel adds elegant look to the cabinet. The central zone with a storage capacity of around 136-191 bottles of wine was designed to store and mature all types of wine at constant temperature. The 2 other compartments are where you bring your wines to their desired drinking temperature. The top compartment with cc. 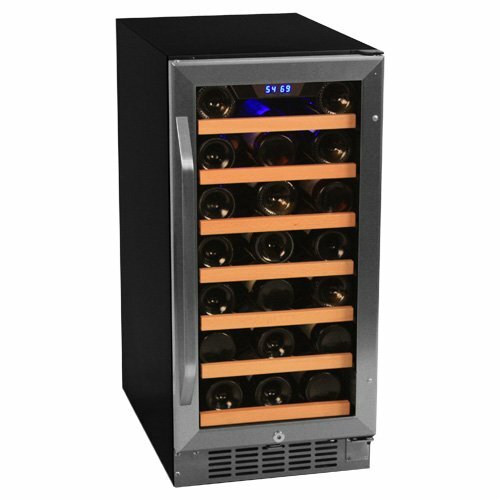 11 bottles capacity cools/warms wines to room temperature while the bottom compartment is for chilling wines. The Amana Reflection Wine Refrigerator contains 12 height-adjustable shelves made of solid beech wood. You can use the shelves either as slide-out shelves or as storage shelves designed to hold stacked bottles. Each storage shelf can hold 77 Bordeaux bottles (100 kg). Do not pull out storage shelves because the bottles could fall. Using the shelves as slide-out you can store 13 traditional Bordeaux bottles of wine in one layer. Always pull out only one loaded sliding shelf at a time. If you use both storage and slide-out shelves arrange the slide-out ones in the centre of the cabinet for easier access. Each shelf has a slot on the front where you can place an identity label to help you organise your wine collection. The upper compartment is for bringing red wines (max. 11 botles) to room temperature. Turn the Room Temperature On/Off Switch to On and this will stabilize upper compartment’s temperature at room temperature allowing you to store and mature reds. The Chiller Compartment at the bottom of the cabinet can chill up to 6 bottles of wine to around 7 °C (recommended for cooling whites, sparkling wine and champagne). Amana Wine Cabinets are equipped with advanced humidity control to ensure constant level of humidity inside the unit keeping the corks in the bottles from getting dried out. The hygrometry system circulates the condensed water allowing it to evaporate thus increasing the moisture content of the interior air. Note: in case of long period of dry weather place some water in a container inside the cabinet to help maintaining constant humidity level. Amana Wine Refrigerators have adjsutable legs for easy and level placement. 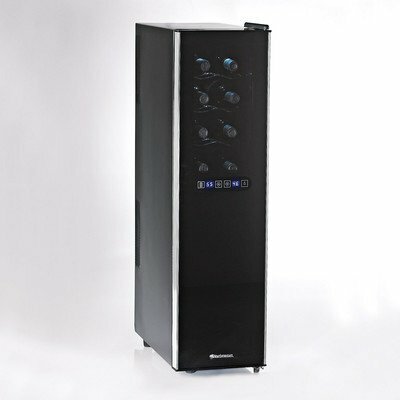 Price: Amana Wine refrigerators were available for GBP 2500 – 3125 from online retailers operating in the United Kingdom. The Amana Precision Wine Cabinet has see-through glass door providing a clear view of your stored wines (price: cc. GBP 3125). 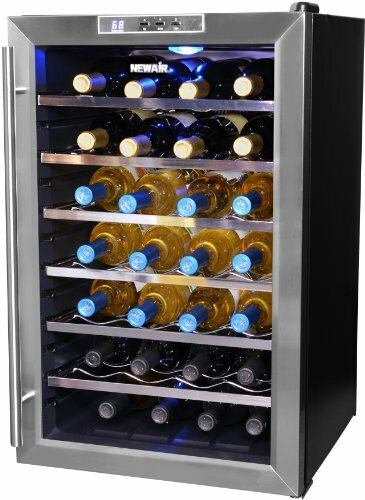 The Amana Definition Wine Refrigerator comes with solid stainless steel door (costs cc. GBP 3225). Remove dust from the condenser (black metal grill attached to the back of the cabinet) regularly. Clean the inside of the cabinet once a year: unplug the cabinet and wipe the inside with wet, soft cloth then let it dry completely before plugging it in. for see our page about Refrigerated Wine Cabinets. 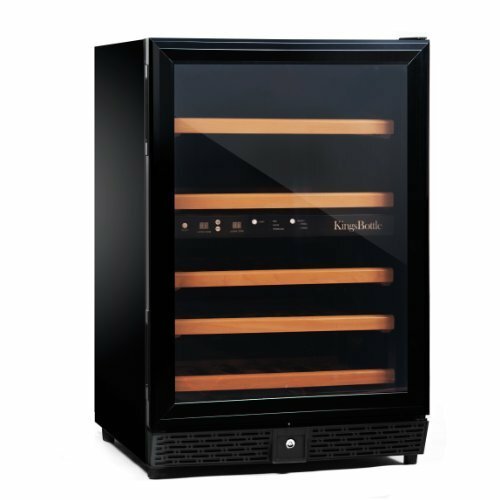 Take a look at review of the Liebherr WS-14300 wine cellar that also has 3 zones. 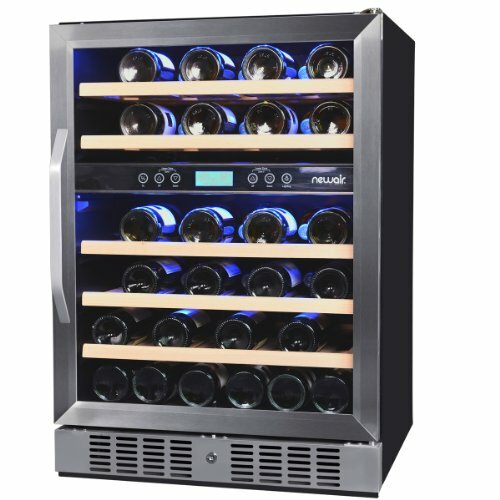 Find out about the most popular 100-bottle wine cooler refrigerators. See also a comparison on three low-cost 150-160 Bottle wine coolers.